Do you have pain in your head, neck, or face? Statistically the answer is probably “yes.” The majority of Americans have experienced head, neck, and facial pain and over 15 percent have been found to experience chronic pain. According to the American Dental Association, problems with the TMJ plague over 20 percent of Americans. Orange Park general dentist and prosthodontist, Matthew Nawrocki DMD, MS, is dedicated to the treatment of TMJ related issues for the residents of Orange Park and surrounding communities. 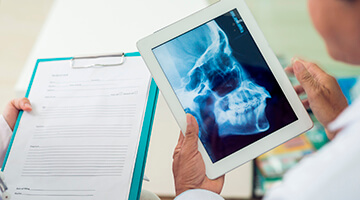 Our patients are given a thorough examination of the head, neck, and bite. This allows the dentist to consider all factors when making a diagnosis. Dr. Nawrocki has been thoroughly trained to treat TMJ. We believe that all measures should be taken to prevent irreversible changes to our patients that are experiencing pain. This conservative paradigm can include altering habits, physical therapy, medication, or orthotic splints. TMJ is often caused by a misaligned bite. When your upper and lower jaw don’t fit together the way they should, your jaw joint receives extra strain as it has to adjust itself every time it opens and closes. Over time, that puts a lot of stress on the TMJ — and it’s something you are likely to feel. We can rebalance your bite with equilibration/occlusal treatments in which we selectively reshape some teeth to improve overall alignment. 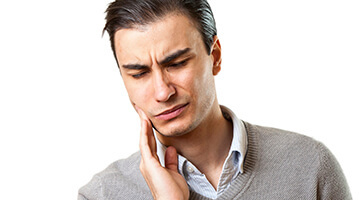 Occlusal splint therapy is a reversible, noninvasive method for treating chronic TMJ pain. Plastic guards (occlusal splints) fit right over the teeth, where they allow your TMJ to relax at last while also providing protection from teeth grinding. In addition to providing therapeutic advantages, the occlusal splint can also provide important diagnostic help for Dr. Nawrocki. Occlusal splints come in many types, and the one that is right for you depends on your specific needs.